We have two lovely medium size edges this week on Randje per week 2015 cross stitch challenge. The free graphs for these edges are here. The black work border on the other side was completed on the beige black work panel. Another border has to be started. This border also will be worked on both sides. Though it is taking more time than I expected, it is exciting to work this double running stitch. The stitch is continuously worked and is completed on the return journey. Interestingly one edge on randje per week challenge is a similar Algerian eye border pattern this week. But it is worked in two colours. On the mirror work yoke, the mirrors are to be outlined with green thread. The other triangles are worked in orange thread, still not too sure that this orange is a good choice. But decided to go ahead with it. This is another multi coloured yoke! After procrastinating for some time, I have decided to start the kalamkari drawing practice. After drawing these borders in 0.5 pencil, they are reinforced with 0.5 pen. The practice is done with the help of the images from the internet. I am choosing elements from the images to learn this art. Still a long way to go, but just happy to stay on track. 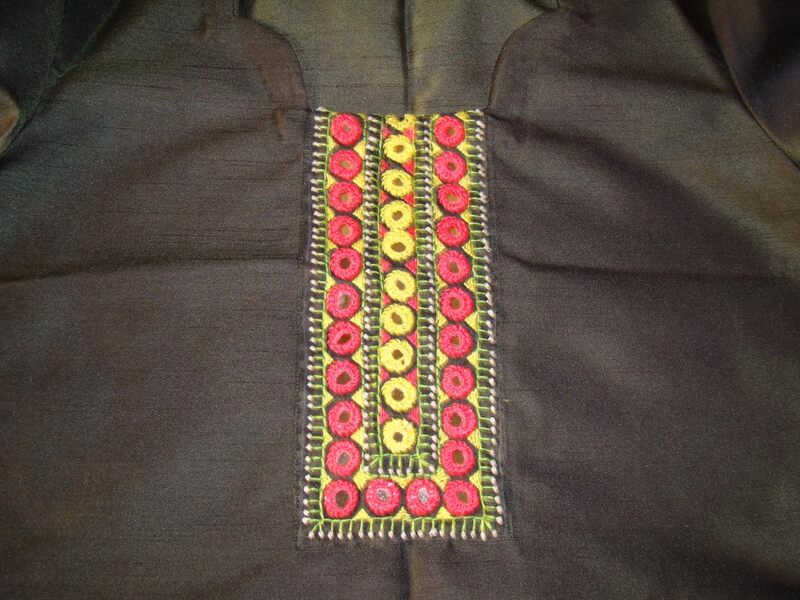 In this part of the series we will see the possibilities of working embroidery on sewn tunics. We all have some plain tunics either sewn by a tailor or bought from the shop. These tunics inspire us to work some simple embroidery to enhance the look. Big shops have same tunics in different sizes, how to make them unique? is the question. Sometimes printed salwars or patialas or leggings, jeans help us to jazz up a plain tunic. The necklines, the sleeves and the style are already there. The first thing to choose is the embroidery itself. The options are- our embroidery skill and use of mirrors or beads or stones. There are embellished pieces available in the market. These pieces can be glued or sewn or appliqued on to the tunic fabric. Now moving on to the colour choices. Generally colours are chosen with tunic in mind or are based on the salwar or leggings. Sometimes a colour in our mind also brings about a project. Tracing the design. This is the trickiest part in embroidering on sewn tunics. A well sewn tunic may look odd with wrongly placed design. It is hard to erase the mistakes of the copied design. Ensure the design is placed at the right place before tracing. Some tips- Please work at one sitting, instead of moving away for some other purpose. Use a steady hand. Stabilize the pattern with pins. Lift and check at different points before tracing. If there are pleats, seams on the tunics, ensure the pattern papers placed properly and careful in drawing over and around them. These are the vulnerable places, where if the pressure applied is more it may cause tearing of the pattern. Place the tunic on a flat surface. Spread it well. Be careful while securing with pins. Pierce with the pin the paper and the tunic together. Smoothen the surface of creases after the pins are all in place. Check often to see the placement is as perfect as possible. This part is not to be done when we are tired. Tracing any pattern on to the fabric is tedious. There is another option. When we want to stitch mirrors, beads on to the fabric, we can mark the points with the help of scale. Small lines and curves can be drawn with the help of pencil and scale if we have a steady hand. Now let see some samples of embroidery on sewn tunics. 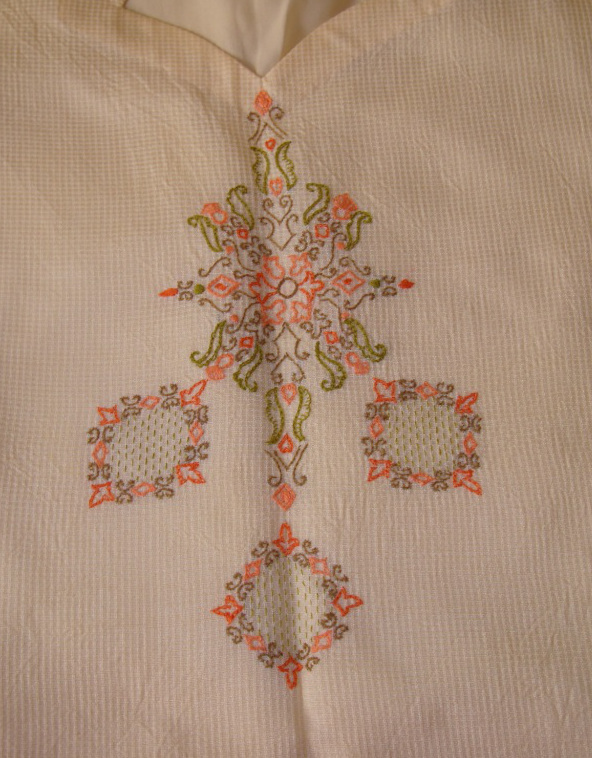 This tunic has a kutchwork motif element which is repeated to make a border. The single motif element is extended a little and used for the centre. 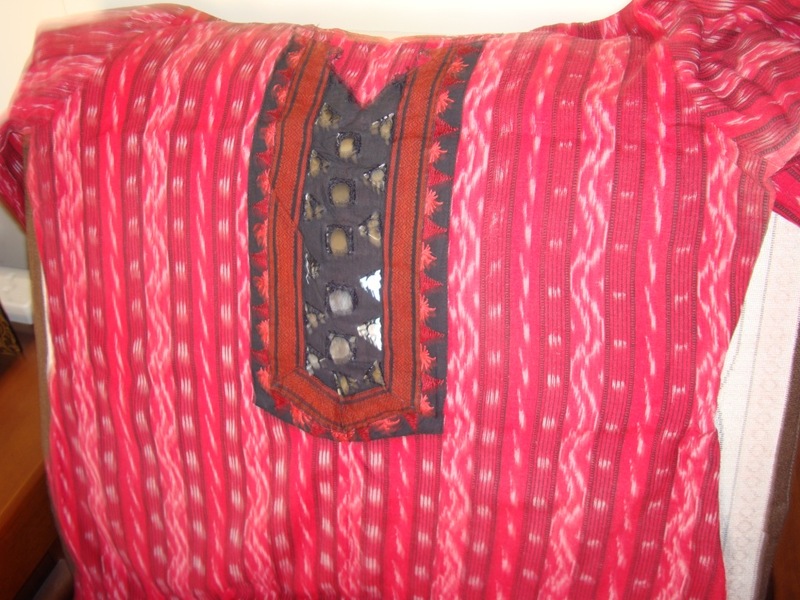 The border was traced without much difficulty with the use of .the lines on this checked cotton mangalagiri tunic. The centre was folded and midpoint of the design was placed on it before securing with pins. 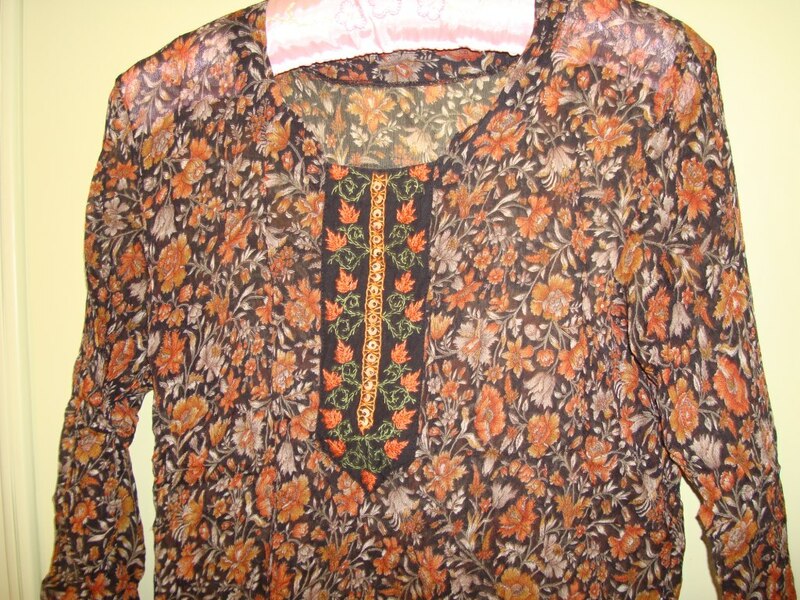 This tunic fabric is Kanchi cotton. The border on the fabric was horizontally sewn in front. The centre was folded and the midpoint of this kutchwork design was placed over it before it was traced. The border was too plain, some line stitches are worked on them and around the neck. 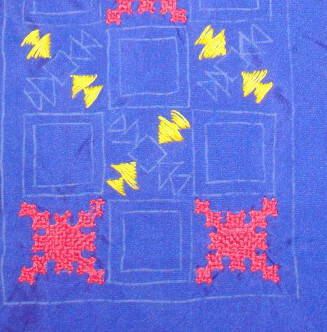 This design with the square especially for this neck was traced in the centre on this cotton tunic. The tunic fabric is tussar. It was sewn with lining. The embroidery was worked with single strand of anchor cotton. To fill inside the design space with running stitches, the lines on the fabric were used. Here are some samples were the markings are made with the help of ruler. In this border, points are marked with the help of pencil and ruler. Fly stitch variation is worked on those marked points in black thread. Mirrors and beads can be worked in this manner. 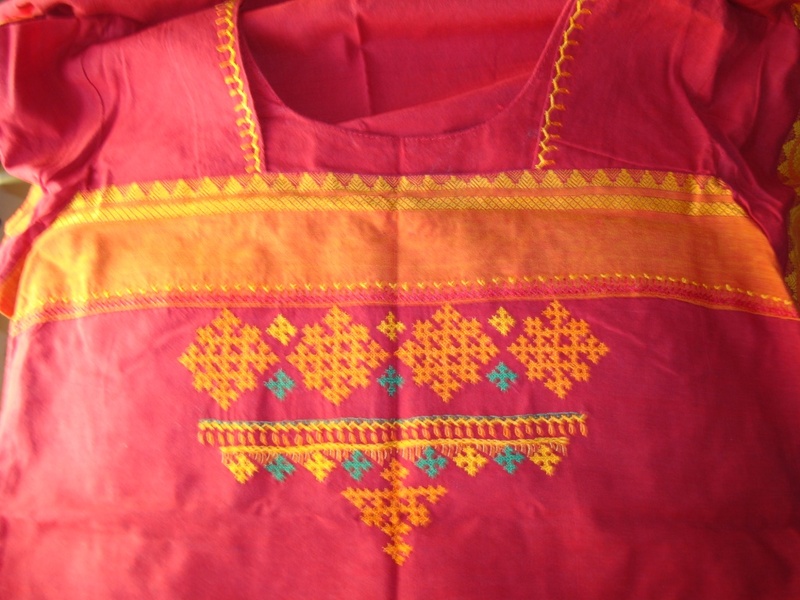 This cotton tunic in maroon colour was sewn with these borders in the front. The sleeves were made in cotton ikat fabric. After copying the motif below these borders, the markings for the mirrors, kutchwork squares were made with the help of ruler. 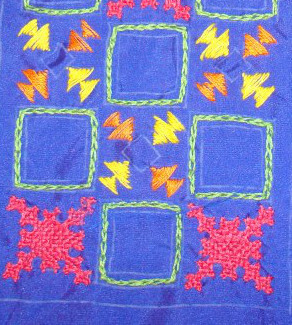 The individual kutchwork elements were drawn by hand. 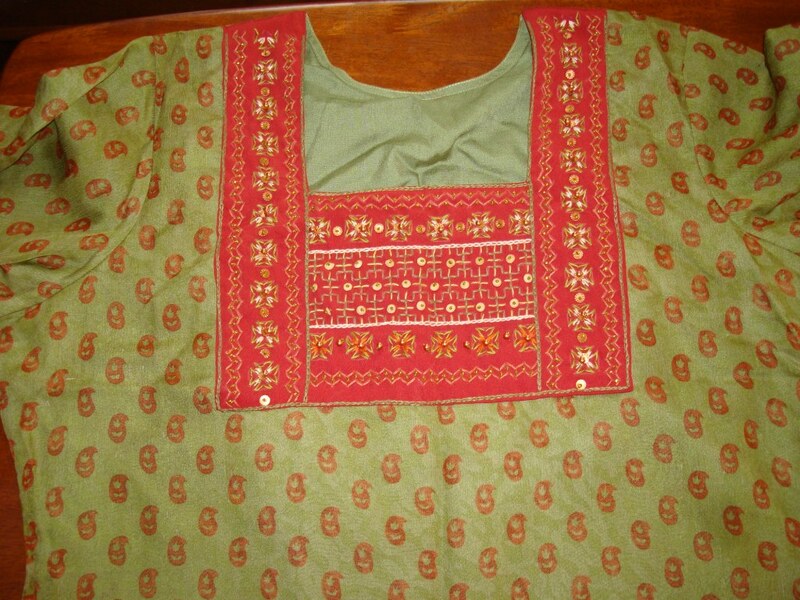 In this tunic, the sleeves, the border and the fabric below the neck were all sewn by the tailor. The paisleys on the printed yoke was highlighted with white thread. The space around the fabric was quite thick, it would have been hard to work the embroidery on it. Using the outline, the kutchwork elements were drawn at equal intervals around it. Gold sequins and beads were added as embellishments. This linen tunic was sewn with tiny pleats in front. Markings were made with the ruler for the flowers, the stems were drawn around it. It was difficult to use the embroidery hoop on these four tunics, so I did not use it. 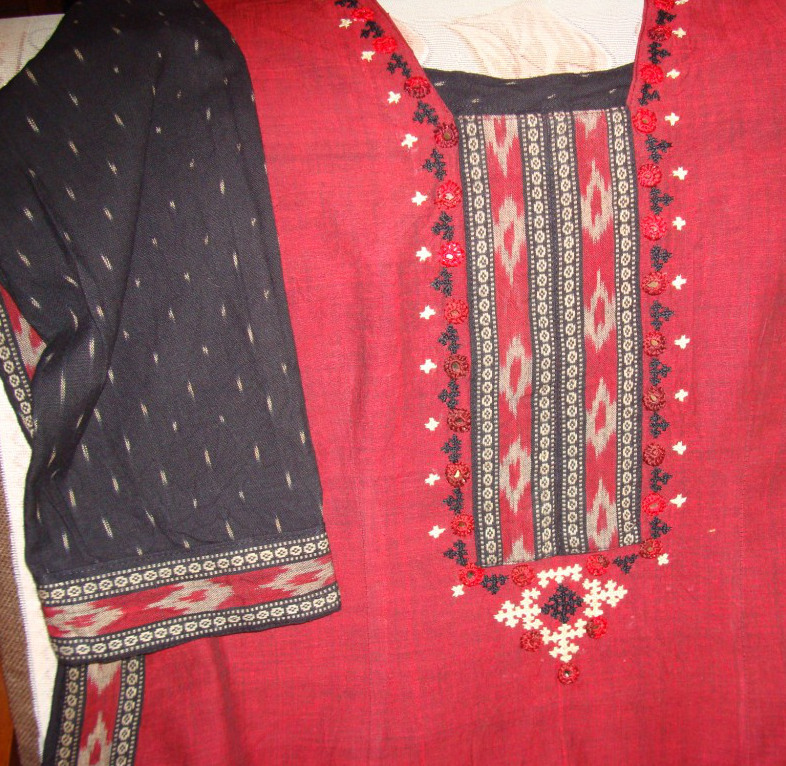 These samples are shown here to explain some ideas on embroidery on tunics. The samples used are my own. Use this as a reference and move ahead and work to create your own beautiful tunics. The last post on this series will be embroidery on tunic part two, where the tailor cooperates and marks the neck, sleeves for embroidery. The 25th week’s edges are very interesting to work. The main thread I have chosen for working on the edges these past weeks is variegated and is not giving enough contrast to the fabric colour. But this 49th edge brings out the full impact of the thread colours. This edge looks very unique and beautiful with the use of two threads. The idea of using the colours together in sequence on these Algerian eyelet stitches was very exciting and I love this edge. The free graph for these edges are here. I have progressed on the black work central piece. A continuous border was worked this week with double running stitch. This border needs to be worked on the other side too.This project is also helping in learning this stitch with a neat back side. The pattern inspiration is from kasuti embroidery . Satin stitches are used for filling these small triangles in the blue mirror work project. This yoke provides a good diversion from the long black work piece. I was browsing through the kalamkari images for inspiration this week. There are lots of inspirational images. Idea of drawing these designs occupies the mind. It‘ll be good thing to learn drawing on a sketch book, which can be used later. This exercise can improve the drawing skill and help in embroidery also. This can be another hobby. One mercerized cotton ikat is waiting for a good kalamkari panel! 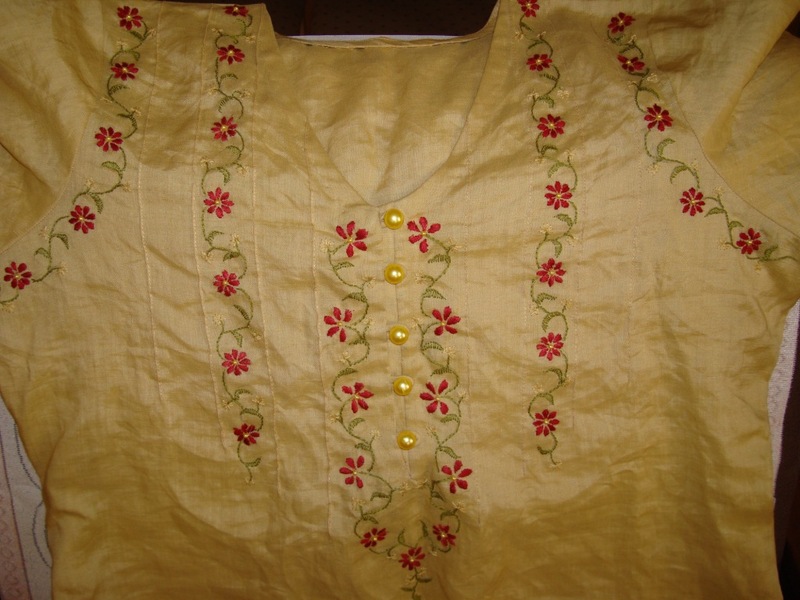 I am also collecting pictures of my old embroidered tunics to use as samples to explain the procedure of embroidery on wearable. The series started two weeks before. 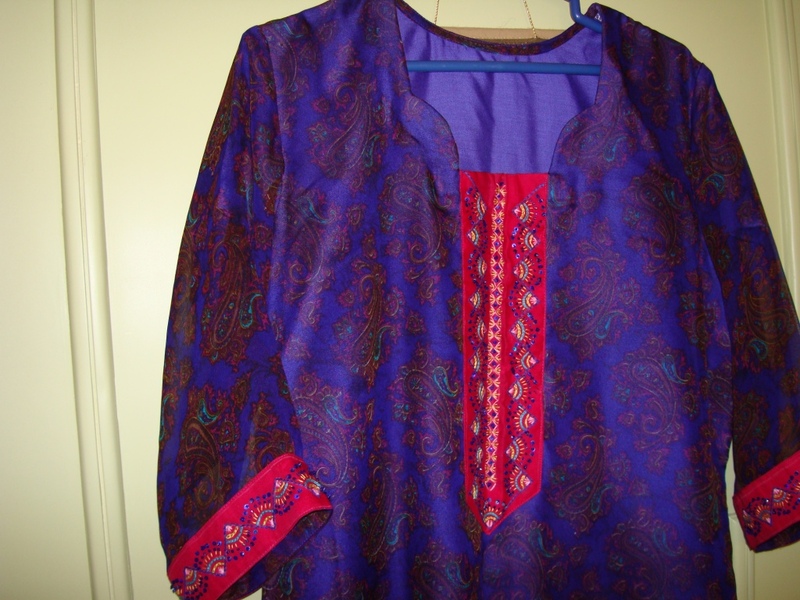 In this post we’ll see some other options of embroidery on tunics. We have come across embroidered pieces of fabrics on stores. These pieces can be sewn on tunics, blouses, cushions, bed sheets etc. Let us see some choices, If we are interested in making our own embroidered pieces. We can design the pattern, choose the colour of the fabric and determine where it can be sewn. 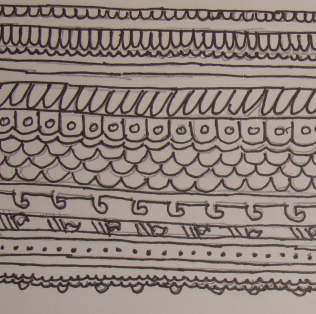 While designing the pattern- There are pattern books, patterns from the net, used patterns from other sources. Before using these patterns, they have to be adjusted to our requirement. Best thing would be to enlarge the design on photo copier to A3 or B3 size. If this is not possible. Enlarge parts of the design and paste them together. The design thus enlarged can be copied on to the fabric directly with carbon paper. 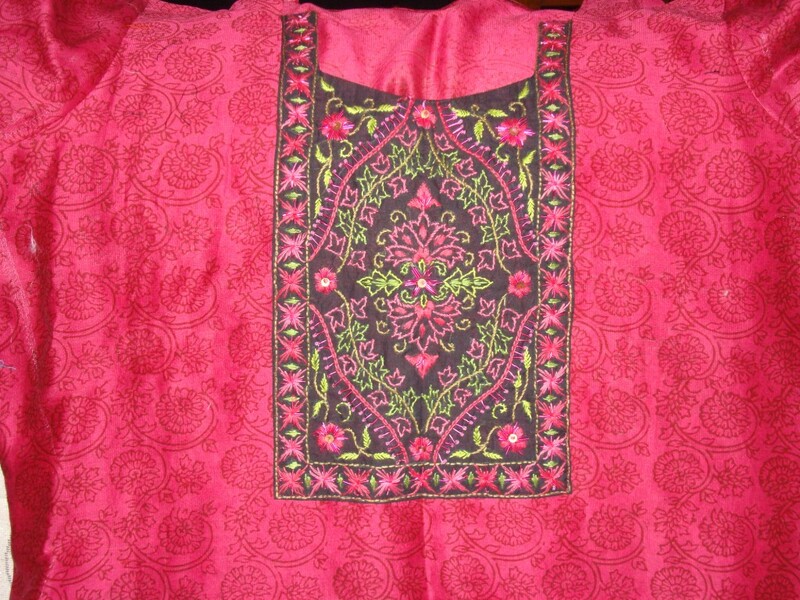 Embroidery work can be done on this separate fabric and sewn on the tunic. Choosing the fabric- the fabric used for embroidery can be of same colour, of contrasting colour or of some colour from the tunic fabric itself, or made of two fabrics. This gives lots of options for creativity. Best places to look for inspiration are the online shopping sites. Placement of embroidered piece on tunic. The embroidered piece can be kept in front of the tunic below the neckline, on the sleeves, on the shoulders,or around the arm hole or the same motifs can be sewn in front. This placement of the piece also depends on the style of the tunic or blouse. Now let us see some samples of the tunics with separate embroidered pieces. This tunic is silk georgette. The embroidery was worked on black cotton fabric. A simple embroidery with wooden beads. The tunic fabric is synthetic trouser material. The mirror work embroidery was done separately on the same material. 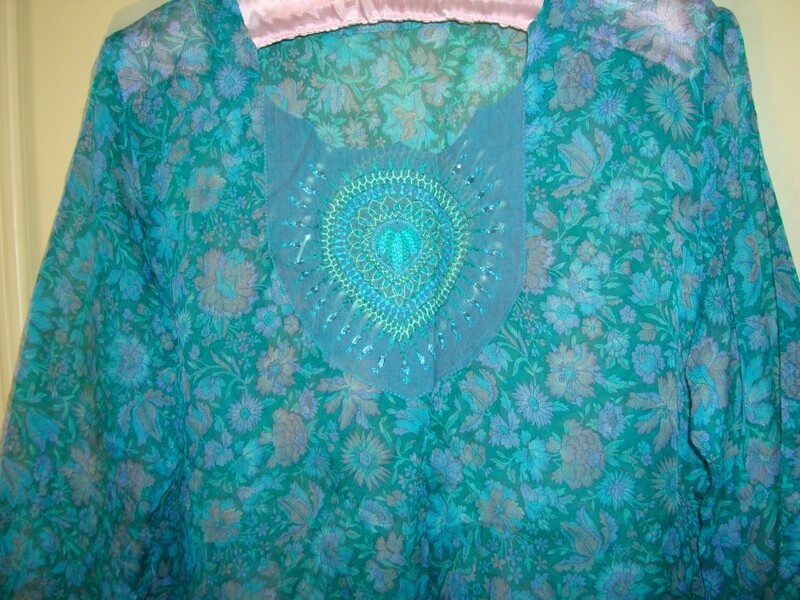 The tunic fabric is silk chiffon. 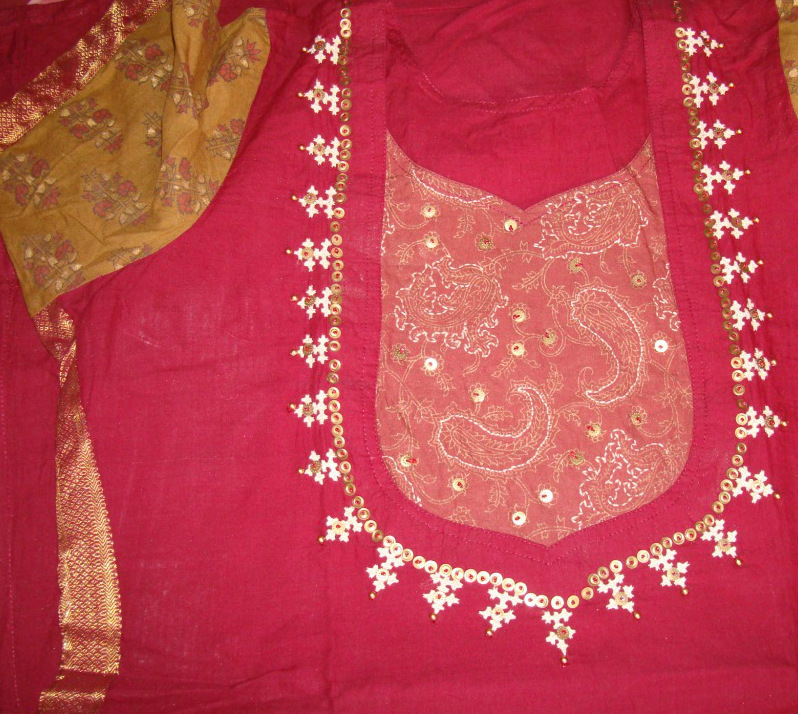 The bead work embroidery on front and sleeves was worked on silk cotton fabric. These are some samples where the design includes the neckline. This tunic is in printed silk. The zardosi work yoke was done on cotton fabric. 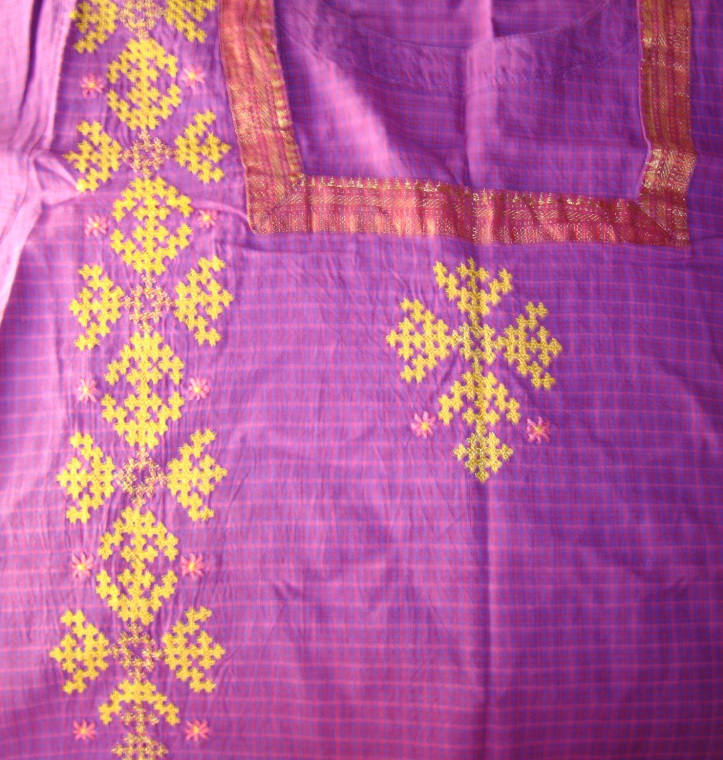 Since the embroidery covers the whole yoke, the choice of fabric does not have much significance. This tunic is silk chiffon. 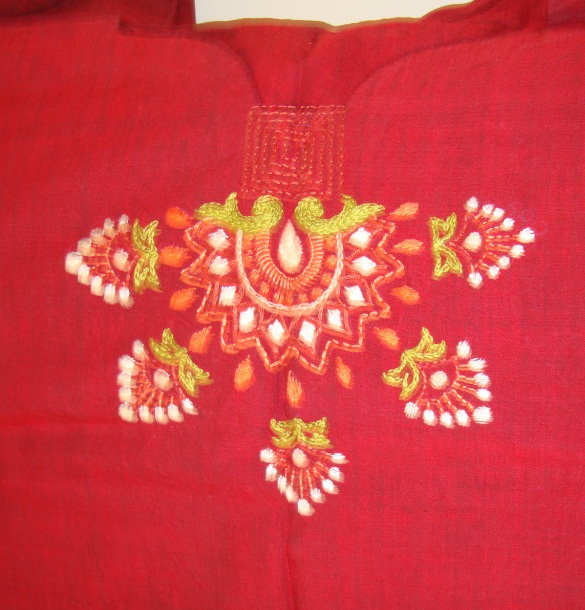 The bead work embroidery in the front is worked on handloom cotton fabric. 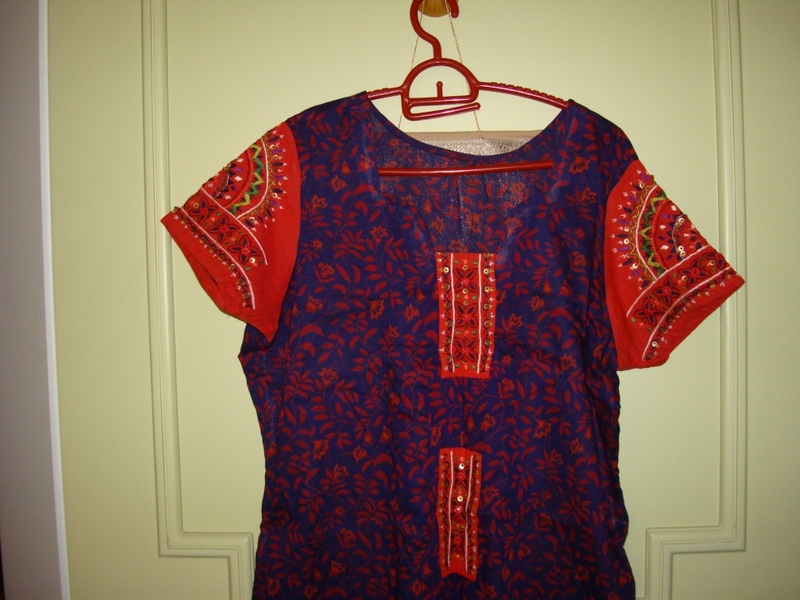 The tunic fabric is silk georgette and the stone work embroidery is done handloom cotton fabric. The fabric differences is noticeable when they are of same colour. The fabric is printed cotton. Three embroidered pieces on red cotton fabric were made for the front of the tunic [last one not seen] and the sleeves were also worked on this same red fabric. Enough allowance of fabric to sew the sleeves was given on the red fabric. All these fabrics were first embroidered and sewn on tunics. The designs were my own. They are all a result of trials and errors. I learnt to contain the errors, before they reached the embroidery stage. So that, the only task was to choose the right colours of thread and the stitches. Still people will have their opinions depending on their taste. These samples are to show that how we can design our own embroidery pieces, which can be sewn on tunics. If any of the steps need elaboration or clarification please ask on the comments. These edges on Randje per week 2015 challenge 24th week are simple and are worked with two colours. The free graph for these edges are here.